A Companion to Medieval Poetry presents a series of original essays from leading literary scholars that explore English poetry from the Anglo-Saxon period up to the 15th century. 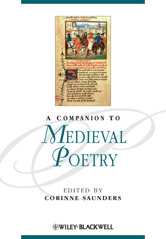 Combines a general discussion of genres of medieval poetry, with specific consideration of texts and authors, including Beowulf, Sir Gawain and the Green Knight, Chaucer, Gower and Langland. Features original essays by eminent scholars, including: Andy Orchard, Carl Schmidt, Douglas Gray, and Barry Windeatt, who present a range of theoretical, historical, and cultural approaches to reading medieval poetry, as well as offering close analysis of individual texts and traditions.